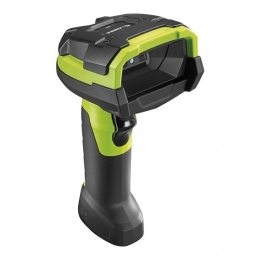 1D and 2D Ultra-Rugged Barcode Scanner is available in various options: standard, ER, HD, HP or DPM barcodes is a durable 2D barcode scanner for industrial applications Zebra DS3608 industrial scanner offers superior performance combined with extreme durability. Thanks to its innovative housing design and use of linear imaging technology, the device comprises no moving parts. This makes the well-balanced handheld scanner nearly completely dust- and watertight IP67 and resistant to drops up to 2.4 m high. The DS3608 thus is perfectly suitable for any harsh applications indoors and outdoors, even with extreme temperatures from -30 to 50 C. Whether standard, ER, HD, HP or DPM barcodes - there is a dedicated version of the DS3608 for any application, quickly and reliably capturing almost all 1D or 2D barcodes in a range up to 21 m.
Good reads are confirmed through a practical triple feedback two bright LEDs in the sight field, a distinct sound and a short vibration ensure unambiguous response at every scan and greatly increase user efficiency. The LI3608 comes factory-fitted with a multi-interface, enabling connection via USB, RS232 or KBW interface as needed. A three-year warranty provides long-term investment security.